LOS ANGELES – Southern California’s longest-running tennis event, the Mercedes-Benz Cup, will be held again this summer at UCLA, with new dates of July 12-18. In 2003, the venerable ATP International Series event featured a dramatic and entertaining championship singles final in which former world No. 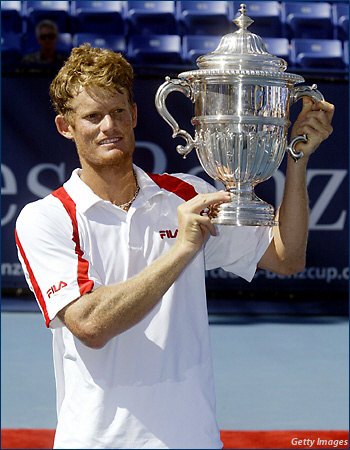 1 and U.S. Open and Wimbledon champion Lleyton Hewitt was upset by No. 7 seed Wayne Ferreira, 6-3, 4-6, 7-5. Mercedes-Benz USA has extended its title sponsorship of the Mercedes-Benz Cup for two years, through 2005. The luxury car company has been title sponsor of the event since 1997. The Mercedes-Benz Cup enhances Mercedes-Benz’s extensive sports marketing program that includes sponsorship of ATP Tennis, PGA Tour golf, and Formula One Racing. Mercedes-Benz is the preeminent corporate partner and the Official Car of the ATP. Its three-pointed star logo adorns the nets at more than 50 ATP tennis tournaments each year, including the Tennis Masters Series.